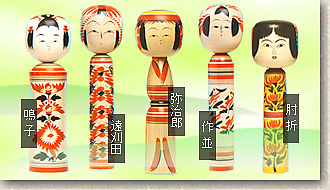 Take a fresh look at the traditional and iconic Japanese kokeshi folk toy by exploring its origins and history. This collection of photographs documents pieces from the extensive private collection of Itske and Anthony Stern. The photos and accompanying text were presented during a public program, Kokeshi: Not Just a Toy!, at the Japanese American National Museum on July 25, 2009 in conjunction with the Kokeshi: From Folk Art to Art Toy exhibition on display from July 11 through October 4, 2009. Collector Itske Stern, author of articles about kokeshi for Daruma magazine and other Japanese publications, and her husband Anthony, talked about the history of traditional kokeshi and their personal journey in collecting over 1,200 of these beautiful folk toys. ylkawashima — Atualizado em Nov 29 2011 4:11 p.m.